Japanese stiltgrass is a summer annual grass that generally grows 1-3 feet in a branching, sprawling, mat-like manner. 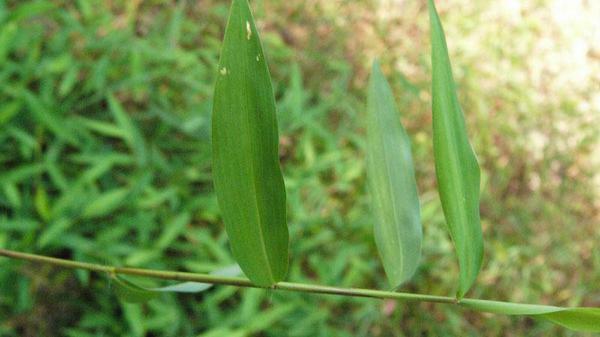 Its pale green leaves alternate along a branched stalk, and it resembles a small bamboo plant. Leaves are narrow and lightly hairy. One feature to notice is the pale stripe of hair along the midrib of the upper leaf surface. Japanese stiltgrass spreads rapidly, and out-competes native vegetation in areas of low light. Precaution and Remarks: Labeled for broadcast treatment use in residential and athletic field turf, as well as in nonresidential turf sites including sod farms, golf courses (excluding greens and collars), parks, roadsides, cemeteries, and commercial properties. Tolerant turf species include Kentucky bluegrass, tall and fine fescue, perennial ryegrass, and centipedegrass at seeding and then anytime beyond 28 days after seeding. Add crop oil concentrate or methylated seed oil for enhanced control at 0.5 to 1% by volume. Don’t apply greater than 2 fluid ounces per acre per application or 4 fluid ounces per acre per year. Bleaching intensity of susceptible weeds reduced and broadleaf weed spectrum increased if tankmixed with quinclorac, [quinclorac + mecoprop + dicamba] or triclopyr. For suppression of above-listed weeds, add triclopyr at 1 pound ai per acre and make either 2 or 3 applications at 3 to 4 week intervals depending on topramezone rate. Creeping bentgrass is marginally tolerant to topramezone at 0.25 fluid ounces per acre. Test on a small area before large-scale use. Sequential applications may be required to achieve desired level of weed control. For bermudagrass and sheashore paspalum use 0.5 to 0.75 ounces per acre plus MSO at 1.5 pints per acre. Apply only to established bermudagrass and seashore paspalum.